I just got back from a bbq with quite a few famous bloggers in Silicon Valley, in fact it was at Maryam’s house, and it was her birthday. Happy Birthday! During some of the bbq, some of us were talking about Singapore and how we’re seeing this as a great place to visit and how I see it as a new testing ground for many web 2.0 companies to sprout. I’ve met so many people from Silicon Valley that have been to Singapore, from Shel Israel to Lisa Stone. Kevin Lim is reporting in from his “Web 2.0 in South East Asia” panel @ Microsoft ReMIX 2007“, it’s worth a read if you’re watching the web industry in South East Asia. By the way, Singapore is the cleanest and most tech savvy country I’ve ever been to, it’s very modern, and the native language is English. I recently provided some feedback to NBC 11’s Hometown project, an advancement for hyperlocal citizen journalism and the neighborhood network in USA. I was pleased to meet Jennifer here in Singapore who’s very involved with citizen journalism here with the one of the most notable newspapers, the Straits Times. She toured me through a sub-site called STOMP, which is a hybrid of citizen journalists that report in and classically training journalists and editors (yes, with fact checking). From a user experience standpoint you’ll find the design of the site to be very graphic heavy which may seem foreign to western eyes. I’m pinging my friends at the Stanford Innovation Journalism program as well as UC Berkeley, where they’re also carving out the future of Journalism. This is a good case study. As it ends up, I’m going to be interviewed by the Straits later today, I’ll post a link when the interviews goes out. Are you familiar with what we’re doing with the San Jose Mercury news? Old and new media can work together. Just landed in Singapore, an amazingly clean city, looking forward to learn about the tech culture. It was quite a commute getting here, nearly 20 hours from SFO to HK, to Singapore, but well worth it. My presentation for the main congress (I’m giving another one to the local university) is about audio and video podcasts for the enterprise. While looking at the program, I was seeing quite a few topics on preparing the IT infrastructure for streaming media, or preparing the anticipation of the enterprise being the media producer. I’m not so sure that’s the way it’s going to unfold. The more I think about it, I see Google, PodTech, and a variety of other media creators to be where content is created, uploaded, and distributed –it doesn’t have to be hosted on the enterprise. There’s a lot of talk about Software as a Services (SaaS), and we’re seeing more evidence of this as raw computing power, storage, web-architectures, and I think it’s spreading to the media space. I’m part of the Media 2.0 Workgroup, a great feed to subscribe to if this topic interests you, I hope some of those folks in the group chime in. Perhaps the greatest thing that enterprises could do is to make sure that 1) Those media networks (and whatever comes next) are never blocked from the firewall 2) there’s enough bandwidth to easily view any of those networks 3) Empower, educated, and encourage employees to join those media networks –as that’s where the conversations about a market will happen. Media will be uploaded, edited, modified, shared, published, and mashed into new forms in the “cloud” –all outside of the corporate firewall. I started to read Everything is Miscellaneous by David Weinberger, it’s an easy read, I’m already half way through the book by reading on the plane. While my focus is primarily on corporate web strategy, I was asked by Kara to come in and share with graduate students at the The Initiative on the Future of Journalism, here’s their project site. The folks I met (and their facilities) are geared up to use the new (social media) tools that are present in today’s modern communications. They’re adapting quickly where others have withered. The news room itself was rows and rows of brand new Mac computers, and when I walked in I saw Twitter, their blog, and tons of other tools, you can check out their site to learn what they’re doing. As I understand it, Dan Gillmor, (we both presented at the New Media Summit this week) is a big supporter of this program. Be sure to read his eloquent piece that Journalism isn’t dying it’s evolving, I have to agree, I witnessed it last night. I hope that this group meets up with the Stanford Innovation Journalism program. To me, they should be bouncing ideas off each other in near real-time speed. I’ve already made some introductions via email. 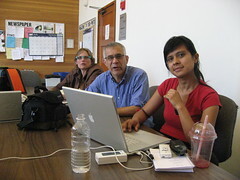 PodTech has hosted the Injo program at least twice. Faster and Faster: From asynchronous to real-time. I showed them how communications are moving faster and faster with tools like Twitter and Ustream (a company I advise). As I launched Ustream (live video streaming with chat, watch the archive) Chris Heuer jumped into the chat room and started to ask questions and add to the conversation. That’s disruptive (in a good way). I’m speaking at Chris’s event the Social Media Club this Monday, and he added a very good point in the chat room. Editing still has an important role, as no one has time to watch JustinTV all the time, a 10 minute summary once a day in video format would really make it digestible. I recorded the live ustream video, usually I’d spend more time with aiming the camera, but this is more of a demo. Media is taking new forms and shapes, expect media pieces to be captured everywhere (some of the students had the new Nokia phones) distribute everywhere and into different shapes and forms (RSS will pull content into new forms) and then morph into something new as the community will help add, edit, or comment it. I’ve been discussing this amorphous ubiquitous concept since 2005. I shared how they need to start learning how to listen, by using Technorati to find people in your community (whoever has been linking to Stanford’s Injo program is in your community) and how to add them to your feedreader. Why only use Lexis Nexus, when the communities that you’re reporting on are telling their stories first person using social media tools? In many ways, journalists could be embedded reporters, by just using a feedreader to listen in on what’s being said. I mandated that those present should be using a feedreader in the next five days. How can you report if you’re not listening to the stories already being told? Those that are already sharing may be the most passionate, knowledgeable, and connected ones in your industry so you’ll need to connect to them both to get your story as well as help distribute your story. This is my focus area. I was asked to share some ideas on how to launch a story, or an interactive story. The future of media is amorphous, so be prepared for your content to take many shapes. It could appear in a feedreader, an aggregator, a widget on Facebook or on a blog. Your website is no longer a static website authored by you. Embrace the community in which you’re reporting about, include links, quotes, or aggregate their content. I explained that I believe that corporate websites are irrelevant, and that probably relates to news websites too. The future of websites will have all members of the community writing, adding, editing, and voting on it. This is why I’m closely following tools like PublicSquare, which allow just that (more news on that soon). I forgot to share with the group about newstrust, (my review of newstrust) which is a unique multi-tiered system that I was given a demo by the founders, it uses several sources of editorial layering. It’s an ecosystem where everyone is sharing (remember that you can share without ever typing, there are tools like Digg, or even sharing from your feedreader like Scoble). The concept that journalists are writing for an audience needs to evolve. Journalists should join the communities (it’s easy with social media) that they are learning about, adding value. In return, these communities will add to the piece, promote the piece, and build upon it. When I attended the WeMedia conference in Miami earlier this year, I was amazed at the tension of “us vs them”. It was clear that the hard liners were resisting and having a hard time letting go to gain more. It didn’t feel like this with this group, or with Stanford’s Injo. I remember that the hardliners were attacking blogging as journalism. Blogs are simply communication tools and can be used in a variety of ways, by no means am I a reporter or consider this blog a news source, it’s intended to be a living white paper. Of course any media revolution is only as good as it’s message. Even with mass layoffs at the SF Chronicle this last few weeks, it’s a clear indicator that the hard-liners are being asked to move off and new skills and concepts that it’s “We” not “us vs them” are needed. Let’s take for example the tech industry. For the most part journalists and bloggers co-exist (except from a minor scuffle here and there). That may be due to the ‘open source’ mentality that we all share in order to gain more collectively, or that bloggers read mainstream, and vice versa. Techmeme is a manifestation of this, as it aggregates the conversations and stories and viewpoints in near-real time. Here’s an example of Dan Gillmor’s piece and the discussions around it. On the preferences, be sure to expand discussion excerpts, there you will see the site cascade like a threaded river of news. Also check out Tailrank which has similar features. I forgot to share the future newsroom, where PodTech hosted BlogHaus at the Consumer Electronics Show in Las Vegas for 120+ hours straight at a suite in the Bellagio. Here we accepted bloggers, pocasters and videobloggers as the new journalists. It wasn’t exclusive however, we embraced mainstream journalists in addition. This video is a good sample of this event, the output, just staggering, see my clip report. What is PodTech? It’s a network of video bloggers, (some are former journalists) we’re an example of this new media generation, we break news, be interesting, or add value. What’s my role with the evolving journalism industry? Honesty, I’ve not given it much though before meeting Tina (who’s with Stanford’s Injo program) who’s now on loan at Podtech this is an expanded scope in my focus. I see how it can directly apply to corporate web strategy as I will need to make sure that corporations stay relevant to adapt to the changing media landscape, and how employee/prospect/customer blogs can easily be aggregated for new stories in any industry. I affectionately call Kara Andrade the sneezer, or the evangelist. Why? Because she got me to come, and now I’m sharing with you all on this blog, I’m sneezing to my community, and everyone I linked to, it spreads that fast. Kara gives me a tour of the facilities, there’s a pretty advanced multi media lab and video lab. Check out the video below for details. We all realize this is insular sharing, and not scientific by any means but I’m learning a lot from folks sharing their Media Consumption diets. The trends are very apparent. I’m most impressed by Dan Taylor’s analysis and graphs. Technorati shows all the blog posts with the term “Media Consumption Diet“. It’s interesting to see how Google results differ using the same keywords. I’m still waiting for Robert Scoble, Jason Calacanis, and Chris Pirillo share their diets. Martin did, and a few others says Technorati. Oh, and my last name is pronounced Ow-Yang. I’m not Irish Loren.